One day when October was just around the corner, my illustrator friend said he was thinking about doing Inktober. I was like ‘What’s that?’ Inktober is a month-long illustration challenge. 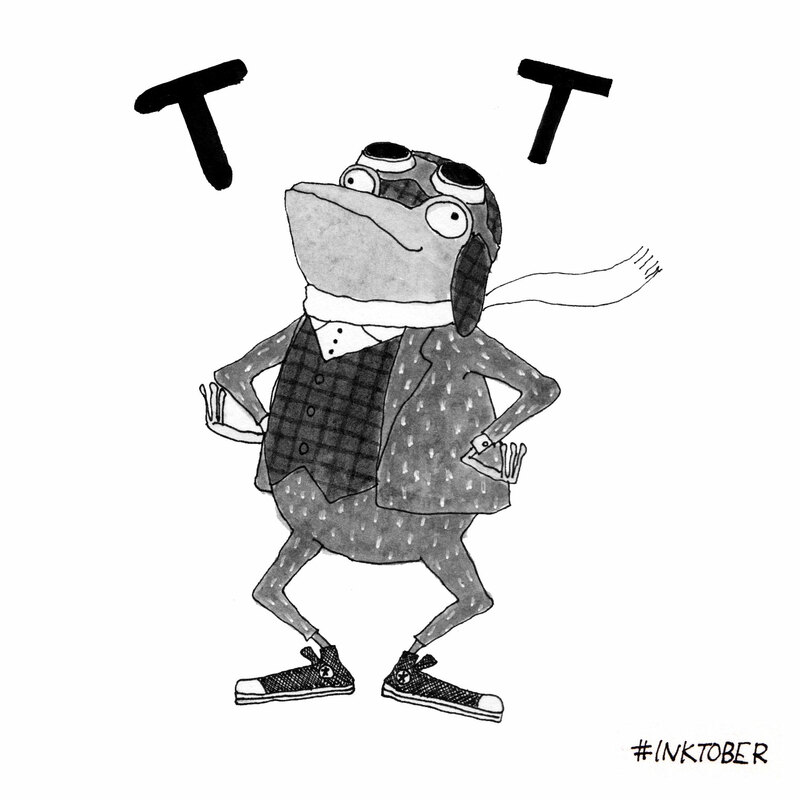 The rules are 1) Make a drawing in ink, 2) Post it online with #inktober, and 3) Repeat everyday in October. I thought it was a great idea! It would push me to draw everyday and with ink (FYI, I’m scared of drawing in ink. This must stem from my fear of squid). So, a determination had been made, but I needed some sort of theme otherwise I knew eventually blank pages would haunt me. Around the time, my friend and I were talking about Edward Gorey, and it was his brilliantly dark alphabet book The Gashlycrumb Tinies that gave me the idea to do fictional character A-Z for my Inktober. Also, I was inspired by my favourite Oliver Jeffer’s book, a witty and surprisingly dark Once Upon an Alphabet. Once I had started Inktober, time wasn’t the problem for me. Rather, finding characters for each letter was the challenge. V, X and Z was especially hard! Originally I wanted to stick to characters from children’s books and films, but I realised I had to widen the criteria to get through all the letters. …So, how did it go? Hugely thanks to my friends who gave me brilliant ideas for the characters, I MADE IT! I’ve done all 26 letters (plus 5 Halloweeny illustrations to make up all 31 inktbers) and I didn’t miss a day! I’m pretty proud of myself and what’s more I’m happy I’ve got some black & white illustrations to add to my portfolio 🙂 I’m glad to have done this illustration challenge and I strongly recommend you to try next year if you haven’t done it yet. Here are my completed Inktober A-Z. My favourite is C, V and T. What’s yours? ?